Some of you may be questioning today’s Pin-Up. “…let’s see some ‘tentacle pr0nz’: Let’s get a look at Lancelot tending his mad garden. I of course laugh hysterically at the idea and went all: Awesome. Done. Ha ha. No. :sly: No I didn’t. She should have known better. And now the rest of you do as well. You can’t joke with that sort of thing around me. I’ll draw it. Let this be a lesson to those that might joke about such things. And also to mad scientists that deal in vines. The herbivorous gardener makes a tempting treat for the carnivorous vegetation. XD Next time, Lancelot, bring a steak to throw to that creature! 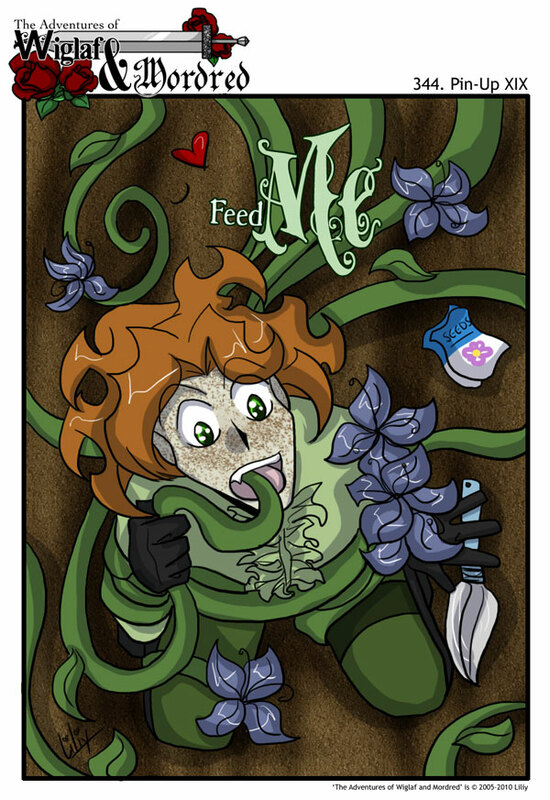 I never though I’d see a cute take on tentacles…..
Of course, I always welcome more Little Shop of Horrors references! But I did ask to see Lance tending his garden! Excuse me, his mad garden. Which of necessity would have tentacles. I just should have known better than to add the “pr0nz” part for a joke. XD But then you might have been tempted to have Lance sedately trimming a hedge or something, wouldn’t you, Liliy? I hope you enjoyed this much better. Thank you, this is perfect, actually. I can see this sort of thing happening to Lance on a daily basis as he strives to hybridize a perfectly aggressive clematis. He probably knows exactly how to get himself out of this situation. If not… well, somebody will find and figure out Audreys IIL, IL, and L someday. *head tilt* Dammit I love this site. Would you believe I actually have a similar sketch in my stack of scribbles? Seriously, a LancelotXHissy picture I drew out of boredom during my government class. I didn’t realize Lancelot x Hissy was a couple people thought of. XD Now I know better. I don’t support LancelotXHissy, but one of the things I do when bored is come up with crack pairings and the idea was so horribly hilarious I had to draw it. I LOVE IT! i especially love the “Little shop of Horrors” quote (was the stage manager for it once). Don’t worry Lancy you’ll get over Driver eventually, but for now I’ll just make sure Hissy gets his growth hormone… muwahahahaha! *joins Lilly in sleep depraved laughter*. Not really; I’m making fun of said subject. XD So theoretically it should remind you of it. Well now I’m scarred for life. I hope you’re happy. My eyes. The bleed fire. But the question is, who’s Bruce Campbell?